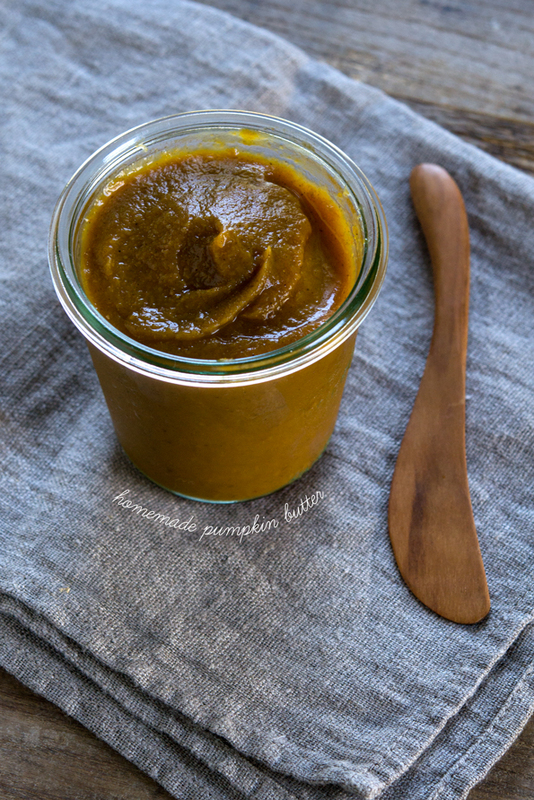 We’ve been talking about gluten free homemade pumpkin butter here on the blog forever. Even so, I’ve never spelled out the recipe for this smooth, spreadable and fragrant fruit butter in the formal, printable way of any self-respecting food blog. So here is my official recipe for pumpkin butter, with instructions for roasting a whole pumpkin and making that into butter, or using canned pumpkin puree in its place. I’ve done both and they’re both delicious in their own special way. If you’ve never baked with pumpkin butter, you’re in for a treat. With less moisture and way more pumpkin flavor than pumpkin puree itself, it’s ideal for baking gluten free pumpkin treats that are pumpkin-flavored, not just pumpkin-colored. And you can actually make crispy pumpkin cookies, an impossible task when baking with straight-up pumpkin. I find these fabulous sugar pumpkins at Trader Joe’s for $2 each, and they’re really easy to roast. And then… toast those pumpkin seeds (instructions below in the recipe). They’re ridiculously good for you, and kids l-o-v-e them. 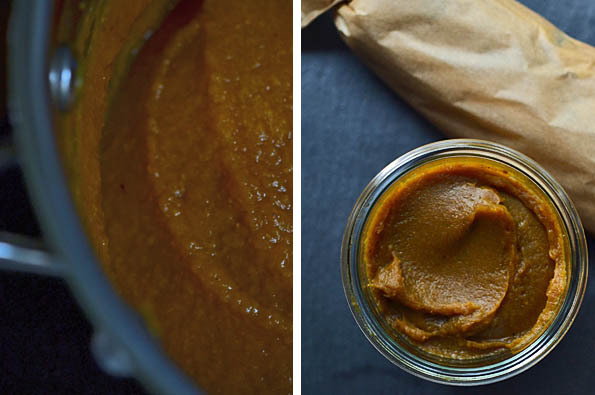 At great long last, here’s how I make pumpkin butter. Now get baking! If using a regular sugar/baking pumpkin, preheat your oven to 375°F. Remove the stem and, with a large, sharp knife, cut the pumpkin in half through the middle. 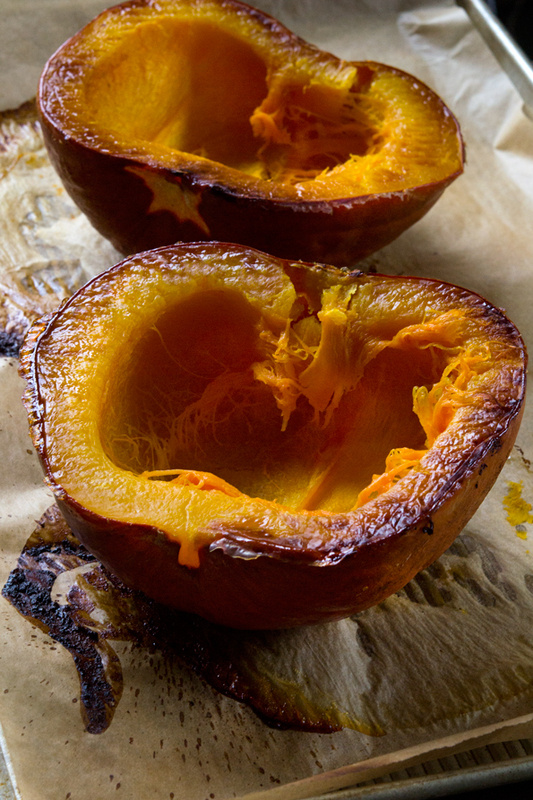 Scoop out all of the seeds (dry them, toss them with plenty of kosher salt, spread them in an even layer and toast them in a dry cast iron skillet over medium heat or in a 300°F oven until lightly golden brown and fragrant) and place the pumpkin halves, cut side down, on a parchment-lined baking sheet. Place in the center of the preheated oven and bake until the pumpkin halves are fork-tender and the flesh has begun to shrink away from the skin (about 45 minutes). Remove from the oven and allow to cool before scooping out the flesh and pureeing in a blender or food processor until smooth. In a large heavy-bottom stockpot, combine the pumpkin puree with the maple syrup, apple cider (or juice) and pumpkin pie spice. Mix to combine well and then simmer over medium heat, stirring frequently, until reduced by about half (at least 30 minutes, depending upon the moisture content of your pumpkin puree). Stirring will keep the mixture for splattering, as will cooking in a large pot. Allow to cool completely before baking with it. Store in an airtight container in the refrigerator until ready to use. I’m so excited to try this! How long do you think it will keep in a closed container in the fridge? Can I use pumpkin butter that I purchased from a farm market or do I have to make it from scratch? I’m excited to make some yummy pumpkin treats and I want to make sure they turn out right. In both this, and the recipe for pumpkin butter in the Pumpkin Chips Ahoy post you include pumpkin pie spice, however it is not there with the Pumpkin Biscotti. I just want to check whether or not to include the pumpkin pie spice when I make pumpkin butter for the biscotti because I really want to make it but I’m kind of confused now. Thanks! Good question, Jennifer! It’s really a matter of preference. I almost always put in the spice, but sometimes when I know that I am making the pumpkin butter to use in a particular recipe that already calls for a good amount of pumpkin spice, I might leave it out. Honestly – this always in the back of my mind to make – but not for one of the recipes above….. I want to make the pumpkin maple scones!!! Yahoo! Hope you are recovering well from the holiday! I missed the part about keeping it on low and burned my mixing hand in a few spots when it spit at me. Feeling sorry for myself….